For those of you who aren’t familiar with the Raspberry Pi device, it’s an extremely tiny, inexpensive computer that will allow you to tinker with writing programs, adding cameras and loads of other fun things. The cloud-based tool allowed me to work from anywhere, not just in my office. My project is an assembly model, so I was able to see some of the benefits of xDesign’s single modeling environment. I may be able to find existing or partial assemblies for this component in the 3DEXPERIENCE Marketplace so I wouldn’t have to design them all myself. Since I am going to be 3D printing a plastic part, I would have the option to use the interoperability between xDesign and SOLIDWORKS to perform some higher-end simulation studies if I wanted. First, I needed the model of the Raspberry Pi circuit board. 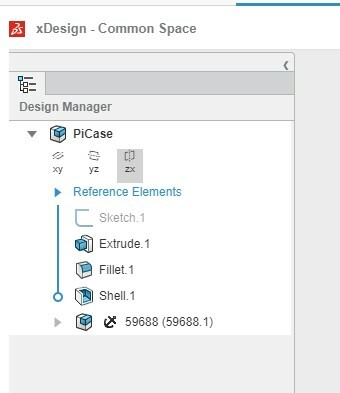 I accessed the 3DEXPERIENCE Marketplace and selected PartSupply, which has millions of components available for me to find, download, use in my designs and even purchase if needed. I did a quick search for “Raspberry” and within a few clicks, I had the assembly that I needed to design my case around. The ease with which I found this surprised me a little. 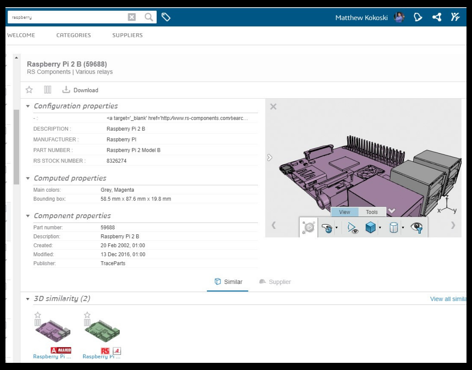 >> Want to learn more about the 3DEXPERIENCE platform? Click here to see how SOLIDWORKS users can benefit from knowing how to use it. The modeling environments in xDesign allowed me to start a component, insert my board assembly and start designing. Once I had my sketch complete, I could tell xDesign what the individual parts were, and have it built the entire assembly tree for me, maintaining all relevant references. I enjoyed designing with the flexibility that a single modeling environment provides. Modeling in xDesign seems very familiar to me, since it’s still a feature-based parametric modeler. For example, when I selected two faces and then clicked the plane icon, I was presented with a plane centered between them, just like I’m used to. Mirroring, fillets and chamfers all work with the ease to which I’ve become accustomed in SOLIDWORKS. I created a few extrusions, rounds and a shell, then added my standoffs and some cuts to complete my base. It was easy to just make that an assembly component and then create the lid. One feature I was happy to find when creating the lid was the ability to use a sketch picture. I placed the TriMech logo on the top of my lid and referenced it easily to create a cut in the same shape. Creating the lid into a component allowed me to move it in the assembly to make sure it was going to work as expected. Stay tuned for part two of this blog, where we'll share with you the process for 3D printing this computer case. 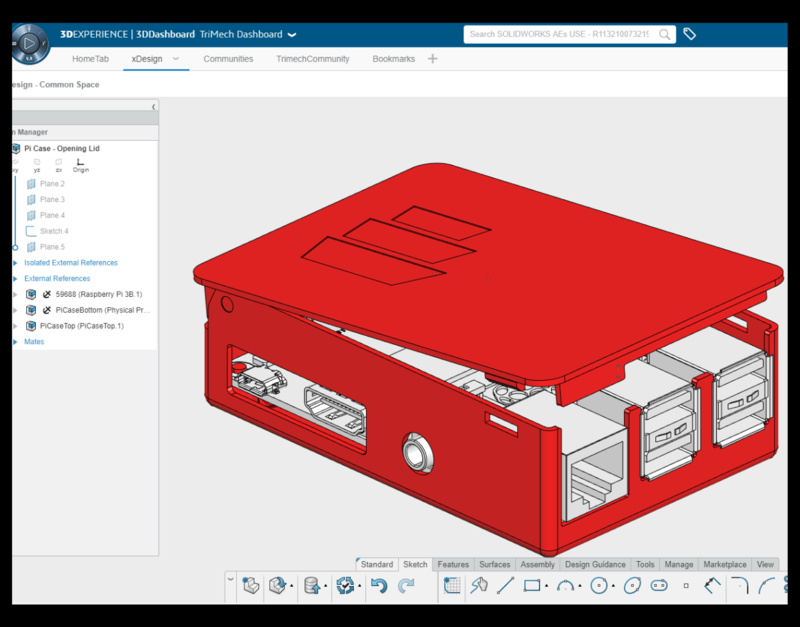 For an in-depth walk-through of the SOLIDWORKS xDesign, see our mini-webinar introductory series.